Radio Woodstock was a linguistic nightmare. The station had the most unique privilege of having the voice of a Chilean exile Scot as the main station presenter and engineer. A Falkirk / Chilean accent!!! Luis Nieto turned out to be as colourful a character in real life, as he was on the airwaves. 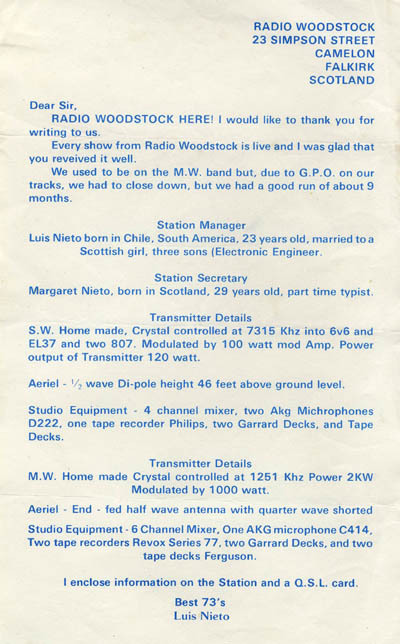 For a few months during the summer of 1980, Luis and his wife Maggie, and partner from his MW days of broadcasting to Falkirk, club / disco DJ Brian McMillan treated the SW dxers to live broadcasts, complete with phone calls taken on air live!! The phone number that was announced was the station number, where the studio and transmitters were. No secret was made of the QTH...!! Former presenter on Radio Capricorn / Radio Sunshine International on SW, Mike Johns even took a trip up to Scotland to present a live show. James Harding of FRBC was also well advanced at the planning of a trip to Scotland before trouble struck. 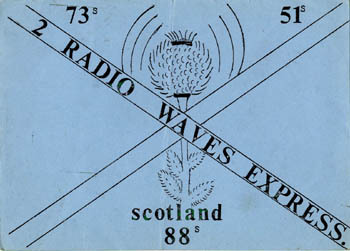 On 12th October 1980 listeners in Europe were left breathless as the GPO and the police walked into the Radio Woodstock studio in Yew Terrace, West Quarter, Falkirk, and closed the station down. The powerful 120 watt transmitter that had been entertaining Europe every few weeks fell silent. 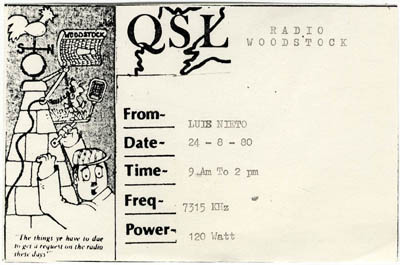 Radio Woodstock often sent out photographs of the studio and presenters along with the QSL cards. 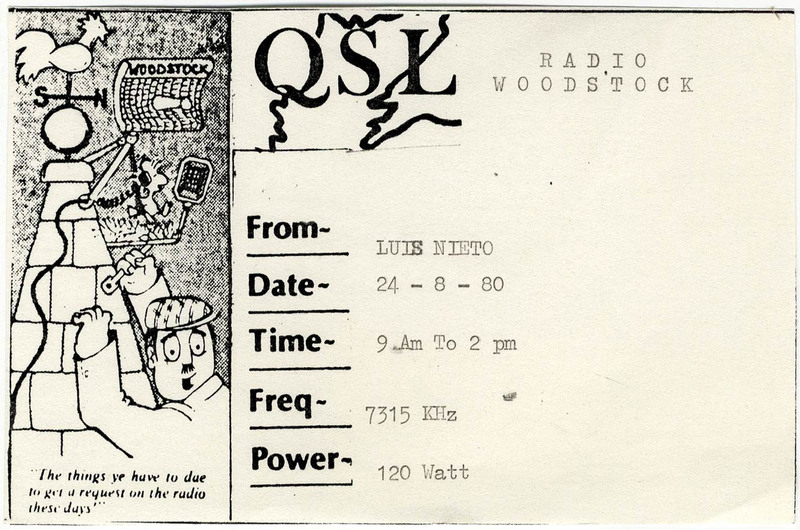 A QSL sent out from Radio Woodstock in 1980, although the times were more like the whole transmission time, and not the time of reception. Also sent out in 1980 was a duplicated sheet with press cuttings, none dated sadly. 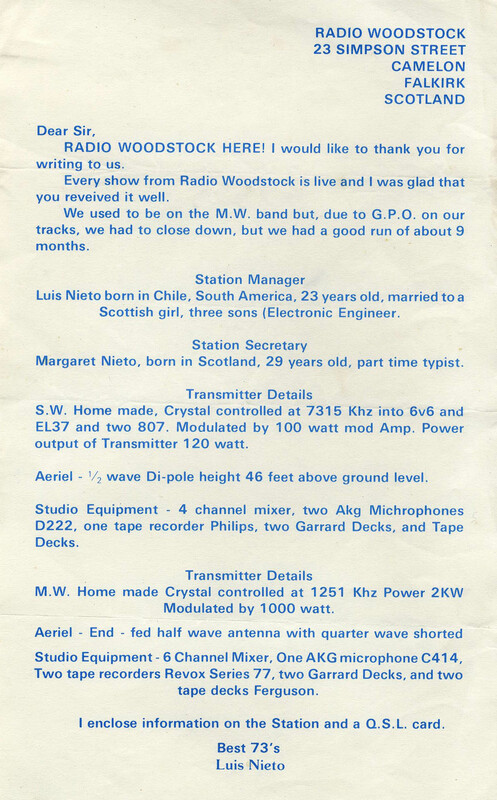 Luis at one stage was going to restart transmissions with a high powered transmitter as "2 Radio Waves Express" This rather unusual station name never made it to the airwaves. The above information sheet was produced around 1982, along with the sticker at the head of the page. 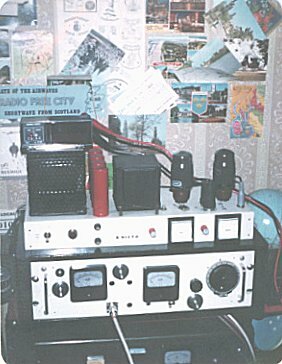 The 120 Watt transmitter which used to play out all over Europe on 7315kHz 41m. Thanks to Jock Wilson of Radio Stella/ Thistle Radio, Luis was pointed in the direction of SW. The initial low powered broadcast was simply Jock, announcing the address of 4 Yew Terrace, West Quarter, Falkirk, Scotland. This was the actual premises of the station, and a more less obvious address was found, of 23 Simson Street, Camelon, Falkirk. The station continued virtually fortnightly, until on November 9th the GPO struck. See below for real audio file of the raid, taken off air. 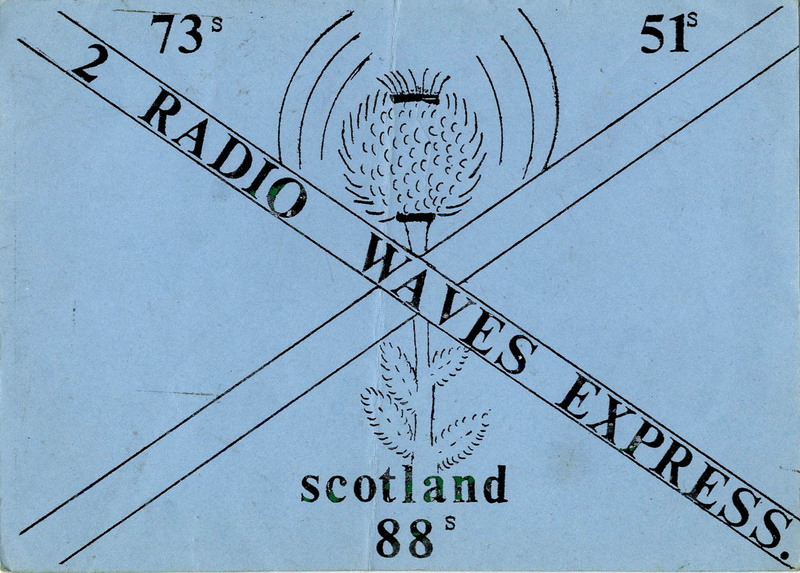 This long gone Scottish SW pirate from the past was heard in 1980 with powerful live signals across Europe. That was until one day they had a knock at the door. Listen to the voice of Luis Nieto, a Chilean Exile, living in Falkirk, Scotland, who obviously still had Spannish as his mother tongue, ask the gentlemen if they want to come in!! Hear his wife on the phone telling the caller that "The GPO's here!". Hear the final gasp as the GPO rip the record off the turntable. 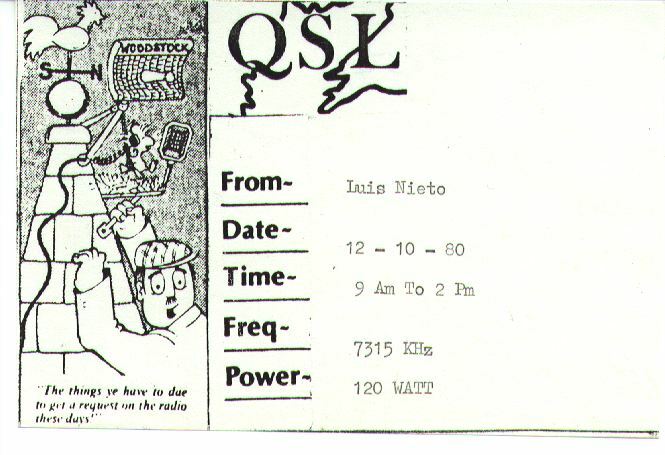 The date for this raid 9th November 1980, on 7315kHz around 1030. Recorded in Scotland, although not in Falkirk.